The Huawei Watch is one of the best smartwatches out there, with its only real downfall being the charging puck you're forced to use. 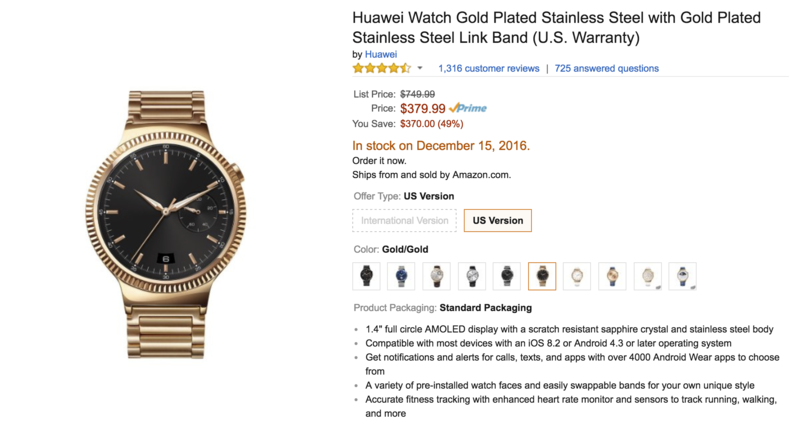 However, if stainless steel isn't premium enough for you, Amazon's got a deal for you. Two gold-plated models of the Huawei Watch, which come with some pretty luxurious bands, have been discounted by up to $370. Now that's what I call a deal. First up, the rose gold Huatch. 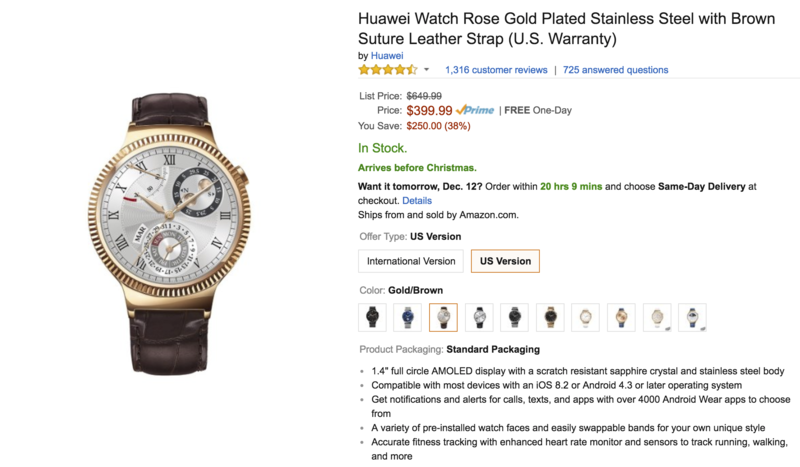 How exactly does this differ from the standard Huawei Watch, you ask? Well, it's plated with real rose gold (a lot better looking than Apple's interpretation, eh?) on the body and clasp, features a knurled bezel, and comes with a pretty comfy-looking brown leather strap - all things that will make regular Huawei Watch owners envy you. This one retails for $649.99, but has been discounted by a whopping $250 to just $399.99. But wait, there's more! We've got an even better deal in store. If you're not really feeling the look of the brown leather strap and prefer a gold aesthetic, the same watch, but with regular gold plating, is just $379.99. The entire band is gold-plated as well, which means that you're getting more gold for less cash. At an MSRP of $749.99, this version is actually discounted quite a bit more heavily than the rose gold-plated model. It's currently out of stock, but more units are expected to come on December 15th. With Prime shipping, this should arrive before Christmas with tons of time to spare. These watches would actually make excellent Christmas gifts, so if you haven't purchased gifts for your friends and family yet, now's a good time to. We're not sure how long either deal will last, so don't wait up!